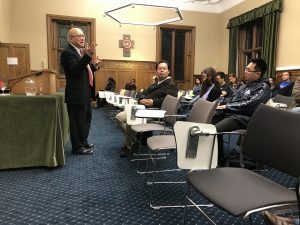 Last week we had the privilege of having Professor Peter Phan, Ignacio Ellacuria Chair of Catholic Social Thought at Georgetown University, deliver the Cunningham Lectures in the School on the topic: Migration of Christianity, Christianity of Migration. The topic of migration is quite timely in today’s political discourse. Whether we speak of Syrian refugees in Europe or Central Americans being stopped at the US-Mexican border, with parents separated from children, it is hard not to encounter news around the so-called ‘migration crisis’. 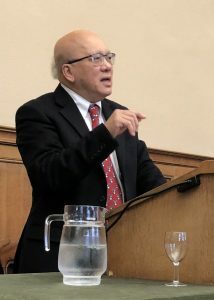 Phan’s lectures, however, argued that migration should not be disregarded as the latest left-wing fad, but deeply essential to Christianity and the Christian message. The first lecture covered Christian history. So much of (Christian) history is written by the winners. Phan instead raised the question of how Christian history could be differently told in terms of the many phases of mass migration: the Jewish Christians in the dispersion, the Germanic tribes, the Age of Discovery, the World Wars, etc. Christianity was forced to change and develop in each of these phases as an unintentional consequence of the movement of peoples. Phan argued that migration has been so central to Christian identity that early Christian writings such as the Letter to Diognetus used the language of ‘aliens’ (paroikoi) and ‘foreigners’ (xenoi) to distinguish Christians from their contemporaries. Provocatively, Phan argued that the migrant church is so central to ecclesiology that we must declare extra migrationem nulla salus—there is no salvation outside the migrant church. The second lecture moved from history to theology. If migration is key to the church, Phan declared that migration is also key to God: Deus Migrator. How can the Trinity be reimagined in light of migration? He briefly touched on the Father and the Spirit, and spent most of his time on the life and the ministry of Jesus Christ. A key text for his discussion was the infancy narrative of Matthew 2—told in nativity plays, but rarely the substance of theological discourse. Phan argued that Jesus was the first migrant of the New Testament—a border crosser, a refugee, a returnee—and should be considered the paradigmatic migrant. The third and final lecture took us from thinking to practice: what are the ethical implications of a Christianity inflected by migration? After a discussion of the virtue of Christian hospitality, Phan turned to the divine command to care for the migrant, ‘for you yourselves were foreigners in Egypt’. So many Americans, British, etc. forget that they were once migrants. According to Phan, ‘being a migrant is a permanent status’. The ethics of caring for the migrants comes not simply because it is charitable or because of their need, per se, but because migration is core to the identity of Christians. Our Cunningham Lecturer gave us a provocative, challenging, and inspiring lecture series. If we are to take Professor Phan’s lectures to heart, then it demands our telling of history, our thinking of theology, and our living of ethics to be radically inflected by a Christianity of migration. This entry was tagged Early Church, Ecclesiology, Ethics, Migration, Peter Phan, Trinity, World Christianity by Alexander Chow. Bookmark the permalink. Nice to read this recap on Professor Phan’s presentation. Even though I am not able to join this Lecture, you bring me to the foundational point of Theology of Migration Professor Chow! Thanks to Professor Phan and to Professor Chow!